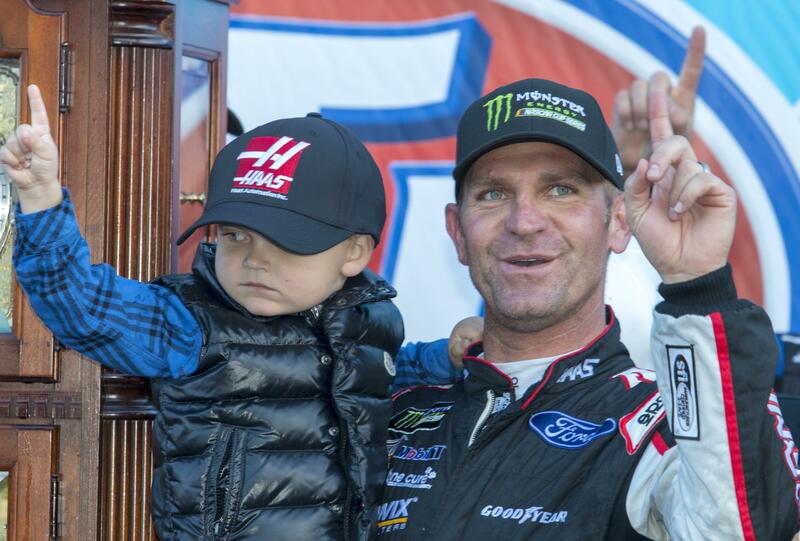 Mon., March 26, 2018, 6:41 p.m.
As Bowyer returned to the track for Monday’s rescheduled race, he told his 3-year-old son he wanted to take a picture with him in victory lane. Bowyer’s victory was his first driving for SHR, the team he joined as Tony Stewart’s replacement last year. The move to SHR was supposed to turn Bowyer’s fortunes around, but his struggles continued through his first year in the No. 14 Ford. Now the Kansas native, a die-hard Jayhawks fan, goes into NASCAR’s off weekend ready to celebrate his victory and KU’s spot in the Final Four. As much as he pleaded with wife, Lorra, the victory party won’t be traveling to San Antonio to watch Kansas play. Lorra Bowyer shook her head no. “Yeah, I’m going to be watching in my basement,” he smiled. Kyle Busch finished second in a Toyota, and Ryan Blaney, who led 145 laps and won the second stage, was third in a Ford. “I mean, we take solace, sure, but you know, ultimately we’re here to win each and every week,” he said. The closing laps were eventful for Denny Hamlin and Kevin Harvick, who made contact late in the race. But Harvick insisted he didn’t intentionally brake-check Hamlin at the end. “He hit me a couple times and I was just trying to make sure I had my car under control,” Harvick said. Doing so meant Harvick slowed in front of Hamlin, and Hamlin crumpled the nose of his car when he ran into the back of Harvick. “He just got to me and, I think, bumped me three or four times,” Hamlin said. “And then I was just bumping him back and he brake-checked me. I probably should have brake-checked him in the first place. Hamlin, who won the first stage, finished 12th. AJ Allmendinger is a two-time runner-up at Martinsville who expects to do well on the paperclip. With his eighth-place finish, he felt fairly satisfied. NASCAR is off for Easter and the Cup Series returns to action April 8 at Texas Motor Speedway. Jimmie Johnson won last year at Texas and then made it two straight the next week with a victory at Bristol. Johnson goes into the break stuck in a career-worst 29-race losing streak. Published: March 26, 2018, 6:41 p.m.